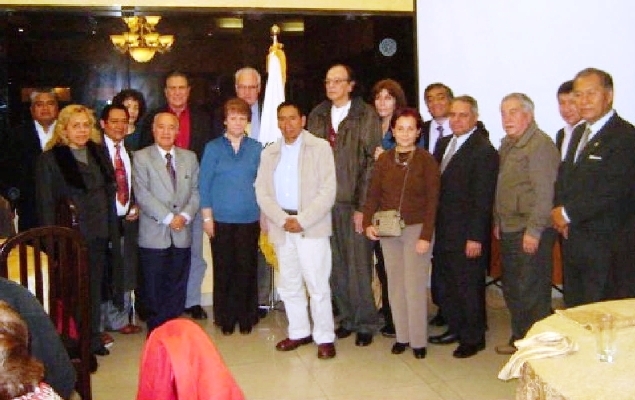 Lima, Peru -- Ambassadors for Peace in Peru gathered together on two occasions in August to discuss the proposal to establish an inter-religious council at the UN and to consider ways to support this initiative. July 28 was Independence Day in Peru, and I was invited to the Congress to listen to President Dr. Alan Garcia give the final such speech of his Presidency. There will be Presidential elections in April 2011, and there are many candidates, including three Ambassadors for Peace! On the last day of the month I had the pleasure to dine with another Congressman and Ambassador for Peace, Dr. Yhony Lescano. He invited my wife and me to his home, where we met his charming wife and adorable children. He is a very busy politician, sitting on seven different congressional committees, but still finds time to take care of his constituency in the high Andean city of Puno. The day following our meeting, he flew to Puno taking with him donations of clothes for the poor people of his area. The winter has been very severe again, and many families do not have adequate shelter or clothing to combat the sub-zero temperatures of the 4,000-meter high mountains. The mission is to bring together leaders of different religions, with the aim of understanding each other, to practice tolerance, and then share this experience of togetherness with their followers so that they too can feel part of the same. We should not forget that in the world we see a confrontation between Muslims on the one hand and Christians on the other. If we are close to establishing an Inter-religious Council then we will be able to affirm our similarities and reduce the discrepancies that exist. Through tolerance we can seek greater mutual understanding.